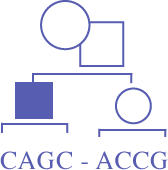 Re: American Board of Genetic Counselling (ABGC) passes resolution to recognize certification by the Canadian Association of Genetic Counsellors (CAGC) for supervision of ABGC students. This month, the ABGC Accreditation Committee unanimously agreed to recognize Canadian genetic counselling certification as meeting the requirements for genetic counsellors providing supervision of the 50 core cases for students in ABGC-accredited genetic counselling programs. The resolution is effective as of March 1, 2012. This update will be part of the ABGC’s 2012 revisions to the Standards of Accreditation (formerly Required Criteria) for Accreditation of Training Programs in Genetic Counseling, which will be available on-line on ABGC’s website later this year (www.abgc.net). For more information, please see the attached letter from the ABGC Accreditation Committee Chair. Effective immediately, counsellors with the credential CCGC (Canadian Certified Genetic Counsellor) and/or its French equivalent CGAC (Conseiller(ère) en génétique agréé(e) du Canada) can supervise and sign off on core cases for students in ABGC accredited MSc programs. This decision represents an important step in the international recognition of the CCGC/CGAC credential. For CCGC/CGAC certified counsellors, this decision increases opportunities for mentorship and supervision of students. For current and future Directors of ABGC accredited MSc Programs, this decision increases the number of qualified supervisors for genetic counselling students and may expand and diversify clinical training opportunities. The CAGC Certification Board is committed to ensuring that individuals seeking genetic counseling services in Canada are receiving these services from an individual with a standard level of competence. Individuals who meet these standards are granted the credential CCGC (Canadian Certified Genetic Counsellor) and/or its French equivalent CGAC (Conseiller(ère) en génétique agréé(e) du Canada). The Canadian certification system has been in place since 1998 and has completed seven exam cycles. Questions can be directed to CAGC Head Office at cagcoffice@cagc-accg.ca.